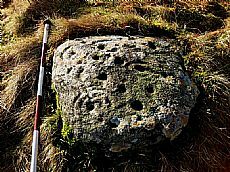 In 2006 Susan Kruse of ARCH discovered a fine cup and ring marked stone on the Heights of Fodderty between Dingwall and Strathpeffer. The stone has fine cup and ring mark decoration pecked into its surface. It was created in the Neolithic or Bronze Age by hammering and grinding with another stone to create an abstract pattern of small depressions, some surrounded by rings. 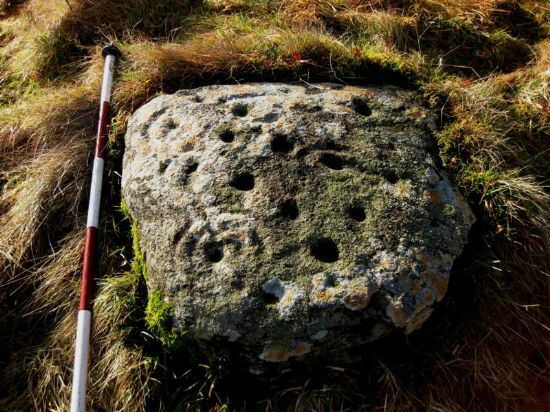 When moving the stone to a new location at the Heights of Brae Neil Gunn Viewpoint, more cup and ring mark decoration was discovered on the reverse side. Finding cup and ring decoration on the opposite side has raised a number of tantalising questions. Was the decoration meant to be viewed from both sides or was one decorated side deliberately placed face down? Or perhaps was the stone carved at different times? Although some stones are decorated on different faces, only a few other stones with decoration on opposite sides are known. But since most of the examples are very heavy or even on unmoveable boulders or outcrops, no one has looked at the reverse sides. 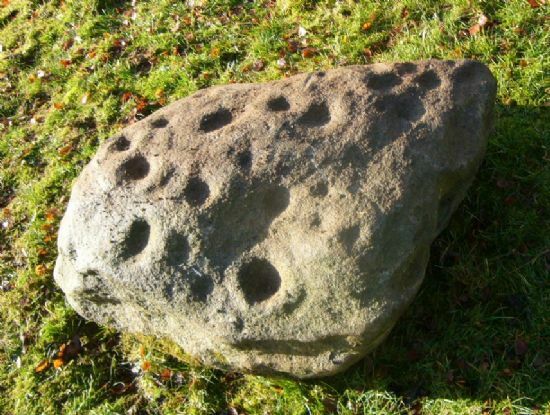 This stone is just one pointer to a substantial prehistoric population in this upland area. There is a cluster of rock art up on the Heights (including three other examples found by Susan Kruse and John Wombell), at least one Neolithic chambered burial cairn and a number of round houses probably dating to the Bronze and Iron Ages. The Heights of Brae hoard from c. 950-800, the largest surviving late Bronze Age gold find from Scotland, was found nearby. At some point, probably a couple hundred years ago when the area of the Heights was settled by new crofters, the stone was moved onto a dyke. More recently, the stone was under threat from new building, and the landowner agreed that it could be moved to another location. 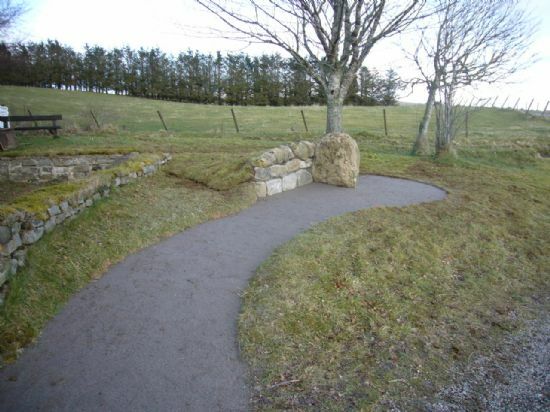 After obtaining official permission from Highland Council and Treasure Trove, John and Susan approached the Neil Gunn Trust to ask if they could provide a suitable home for the stone near the Neil Gunn Monument. 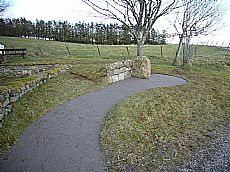 The Neil Gunn Trustees offered a site on the opposite side of the car park to the Signature Stone at Heights of Brae. The stone has now been moved to the Viewpoint and will be one of the few accessible by wheelchair. It has been re-erected on end to display both decorated sides. Cup and ring marked stones have a wide distribution, found in upland areas of northern Britain. Some of the cups are able to hold small amounts of liquids or solids, but in other cases, including the Heights of Fodderty stone, some of the cups are pecked into faces of the rock at angles. Usually the stones and boulders are found lying down, but occasionally, as at the Clava Cairns near Inverness, the stones are even oriented upright, so that the cups are on end. Some areas are particularly rich in stones, notably Kilmartin Glen in Argyll, with certain regional preferences in artistic motifs. Funding to move the stone and erect a signboard was provided by the Strathpeffer Initiative and by the Adopt-a-Monument project which is supported by the Heritage Lottery Fund (HLF), Historic Scotland and the Bruce Wake Trust. The Adopt-A-Monument Scheme is being part financed by the Scottish Government and the European Community Argyll and the Islands and Highland LEADER 2007-13 Programmes.